Admit it. 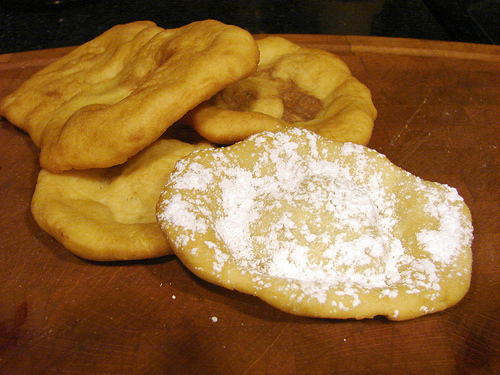 We all have a love affair with fried dough. Doughnuts, beignets, churros, funnel cakes, the little Chinese ones (I don’t know the name). I venture to say that every country likely has a version of this marvel. It makes sense, it is mmmm, good! Here I share Panama’s version of this uber important discovery. Popularly known as hojaldres or hojaldas, you can’t have a decent breakfast without one. One thing I find interesting about them, is that everyone in my little country seems to have a slightly different recipe for it. Some people add eggs, other use oil, no sugar, it goes on. This is how I’ve made them for decades. Mix the flour, salt, baking powder, and sugar before incorporating the butter. You’ll want the flour mixture to look like wet sand. Gradually add water until you end up with very wet dough. I like making this by hand, it allows me to be aware of the texture and consistency of the dough; plus its like playing with your food. I’ve also used my mixer to do it and it worked just as well. Begin to add the additional flour and knead it in. You want the dough to feel soft, but not sticky. Turn it out onto your counter-top and knead it for about 5 minutes. Separate it into balls, whirl a bit of oil on the bottom of a mixing bowl before dumping the balls of dough in. Let it rest at room temperature for at least 30 minutes, the more they rest the more time it’ll have to bloom. Frying the hojalda: you can roll them out with a rolling pin and stretch them out like pizza dough just before dropping them in preheated oil. They fry VERY quickly, about 2 minutes per side, so don’t wonder off too far. They are perfect with anything you’d eat bread with. The hubby enjoyed sprinkling them with powdered sugar, I’m still recovering from this crime. For the full color post, visit my blog chefityourself.